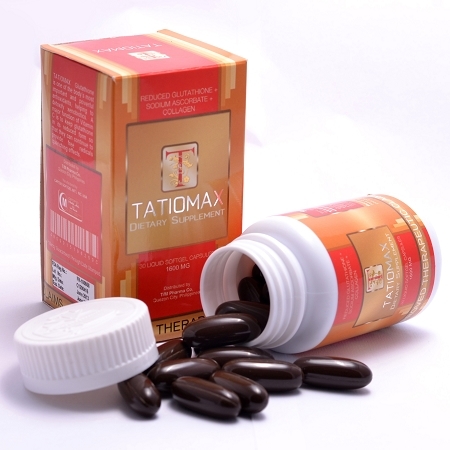 Home > Skin Whitening Products > Glutathione Capsules > Tatiomax Reduced Glutathione + Collagen 1,600mg Whitening Capsule - SUPER SALE!! Uniquely formulated for a higher dose of Glutathione, Vitamin C and Collagen, Now On SUPER SALE!! Reduced Glutathione for Health and Beauty Glutathione is an important antioxidant with many benefits including increased energy, anti-aging and liver health. It is also the most important ingredient in any skin whitening regimen. This softgel is extra large to accommodate 1200mg of glutathione! Vitamin C Support Vitamin C makes glutathione more effective by maximizing its activity and concentration. It allows glutathione in cells to remain in its active, reduced state. It is also essential for natural collagen synthesis, because it is a cofactor in the reactions. Hydrolyzed Bovine Collagen for Skin Renewal Collagen is the most important structural protein in the human body. Hydrolyzed collagen, when taken orally, rapidly accumulates in skin and cartilage. This can vanish wrinkles, cellulite and aging sagging skin. There is no question that collagen is the ultimate anti-aging ingredient! Vitamin C – Vitamin C is an essential vitamin that is involved in many of functions of the human body. Of particular importance is its role in the formation, protection and transport of collagen, the structural protein essential to our tendons, ligaments, skin, eyes, cartilage, bones, blood vessels, guts, intervertebral discs and the dentin in teeth. Vitamin C supplementation can be just as important as taking collagen supplements because of its natural maintenance and protection. Vitamin C supplementation has been shown to whiten skin through its effect on glutathione levels and activity. A double-blind, clinical study at the University of Arizona showed that 500mg/day of vitamin C increased cellular glutathione levels. This effect is probably due, in large part, to the strong antioxidant effect of vitamin C. Maintaining adequate levels of glutathione and vitamin C is essential to cell health and skin whitening. Johnston, CS; Meyer, CG; Srilakshmi, JC. Vitamin C Elevates Red Blood Cell Glutathione In Healthy Adults. American Journal of Clinical Nutrition. 1993 Jul;58(1):103-5. No change after taking it for two months. Felt I went a shade darker instead. So far, I don't notice any lightening effect on my skin and nobody comments on me as yet. However in terms of delivery, I received my items exactly as it was ordered. In the future, I am thinking to get the injection not the pills. The capsules are enormouuus! Like really big! It's so difficult to swallow. 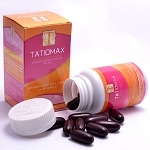 Tatiomax Hydrolyzed Collagen 1500mg 30 Softgels - W/ Hydrolized Bovine Collagen and Vitamin C - SALE! !